Israeli soldiers attacked, Friday, dozens of Palestinian protesters near the main entrance of Hizma town, east of occupied East Jerusalem, and shot a young man with a live round. The army also shot two Palestinians near Ramallah, in central West Bank. Medical sources said the soldiers shot a teenage boy with a live round in his abdomen, before he was rushed to Palestine Medical Complex, in Ramallah, suffering a moderate-but-stable injury. It is worth mentioning that the soldiers are always deployed at the main entrance Hizma, and constantly obstruct traffic, by stopped and searching Palestinian cars, in addition to interrogating the residents while inspecting their ID cards. In related news, the soldiers shot two Palestinians with live fire in the Al-Mughayyir village, northeast of Ramallah, before they were moved to a hospital in the city. The two were shot after the soldiers invaded the village and attacked local protesters. In addition, the soldiers injured several Palestinians in Toura village, southwest of Jenin, in northern West Bank. 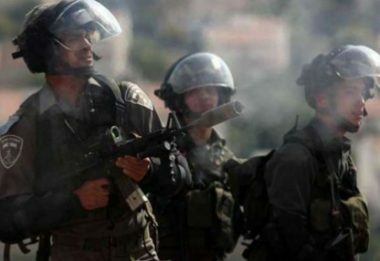 In related news, the soldiers shot one Palestinian with a rubber-coated steel bullet, and caused dozens to suffer the effects of teargas inhalation, after the army attacked the weekly nonviolent procession against the Annexation Wall and colonies in Kufur Qaddoum town, east of the northern West Bank city of Qalqilia.